Poverty Rate Unchanged, But Still Historically High The government says that the poverty rate for 2011 was 15 percent, essentially unchanged from the year before. That still means that more than 46 million people lived below the poverty line last year. According to one economist, "the bad news isn't as bad as it has been." A child waits with a box of food at a mobile food bank in Oswego, N.Y., in June. New census data show that 46.2 million people in the U.S. lived below the poverty line last year. 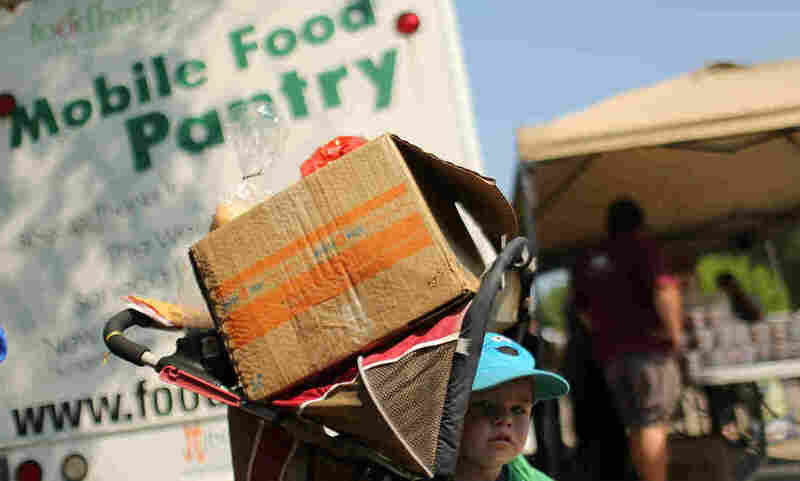 The U.S. poverty rate last year was unchanged from the year before, according to new figures Wednesday from the Census Bureau. But that still means almost 1 in 6 Americans was poor. The new data show that 46.2 million people in the U.S. lived below the poverty line — about $23,000 for a family of four. The number of poor was almost exactly the same as it was the year before, but still historically high. "I guess I would say the bad news isn't as bad as it has been," says Richard Burkhauser, an economist at Cornell University. He notes that the Census Bureau credits a shift from part-time to full-time jobs, especially among lower-income workers, for keeping the numbers from growing. But at the same time, he says, the nation's median household income dropped 1.5 percent, to just over $50,000. Graphic: Snapshot Of Poverty In The U.S.
"But it didn't fall as much as it did last year and the beginnings of recovery are in the wind. The single brightest note in the numbers that we saw today was the increase in the employment of full-time, full-year workers to 2.6 million," Burkhauser says. But he says the job situation is still a long way off from where it was before the recession. And there were other troubling signs. Income inequality grew last year, with the share of overall income growing for the very wealthiest individuals, while it declined or stayed the same for everyone else. And poverty among children was almost 22 percent, affecting more than 16 million kids. "Not only is the child poverty rate stubbornly high, but the youngest children are the poorest," says Olivia Golden, a children and families expert at the Urban Institute. "Children under 6, their rate is stuck at nearly 1 in 4, nearly 25 percent of kids," she says. "And what we know from child development research is that those young kids are at their most vulnerable." That's one factor to consider in responding to the new figures, she says. The Census Bureau notes that the poverty numbers don't take into account the impact of government programs such as food stamps. If those benefits were included as income, some 4 million fewer people would be considered poor. And Golden says that's a good reason to keep those programs strong. But that's all part of the ongoing presidential campaign debate — how best to boost the economy and get people back to work. On Wednesday, a coalition of religious groups called the Circle of Protection released videos by President Obama and Republican nominee Mitt Romney on their plans to help the poor. The president said the poor shouldn't be asked to sacrifice more to give tax cuts to the wealthy. Romney, who supports those cuts, said the best way to help the poor is with a healthy economy — including budget cuts. But Romney added that he's committed to protecting the poor. How that will translate into specifics is unclear, although Wednesday's numbers will likely keep the issue of poverty, at least part of the economic debate.